Frosted Cranberry Body Polish | £10 // This body polish is very much like the Glazed Apple one I reviewed the other week. It's not the most abrasive body scrub there is but it's not completely rubbish either. It's not going to remove stubborn fake tan but is going to do a good enough job at removing dry patches and keeping skin smooth and soft. 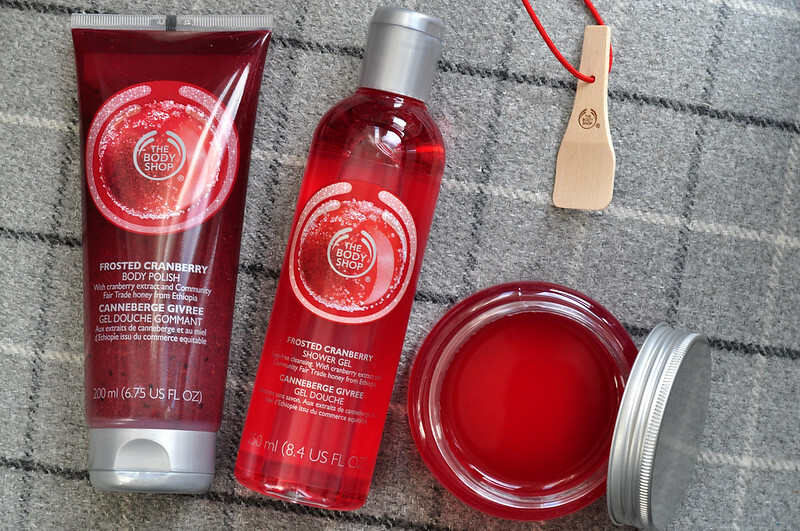 The frosted cranberry scent is lovely as well, it's a fruity fragrance and one that could be used all year round. Frosted Cranberry Shower Gel | £4 // Again this has the standard TBS shower gel formula that doesn't dry my skin out and is perfect to use as a bubble bath. Using a shower lily means a little product goes a long way and the scent lasts on the skin. Frosted Cranberry Bath Jelly | £10 // Despite already trying the Glazed Apple version, I am still impressed with this jelly formula and I hope they use one of their original scents so I can still buy it after Christmas. A small scoop of the bath jelly creates a huge amount of bubbles which smell amazing. I'd love to try one of the bath jellys but I need a bath tub first! ha ha! Tonnes of bubbles sounds amazing to me!